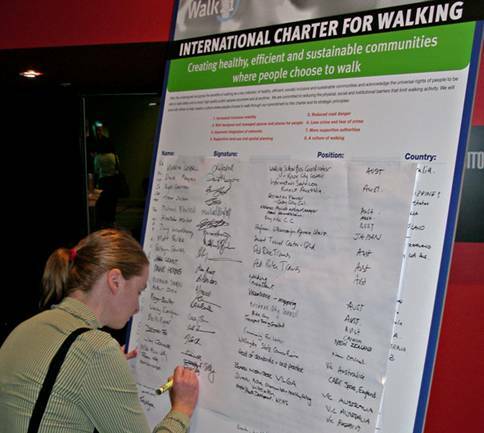 2016 marks the 10th anniversary of Walk21’s International Charter for Walking. It has been adopted by many cities and individuals around the world. Mayors from Sydney (Australia), Tehran (Iran), Vienna (Austria), London (UK), Ottawa (Canada) have signed the Charter among many others. For more information, please click here. Built on extensive discussions with experts throughout the world the Charter shows how to create a culture where people choose to walk it identifies the needs of people on foot and provides a common framework to help authorities refocus their existing policies, activities and relationships to create a culture where people choose to walk. The Charter’s genesis was a presentation by Daniel Sauter at the 2003 Walk21 conference in Portland with the aim of creating a common point of reference, and a policy platform that cities, organisations, neighbourhood groups and individuals could sign up to. The Charter was discussed again at the 2004 Walk21 Conference in Copenhagen and the 2005 Walk21 Conference in Zurich, as well as a wider worldwide discussion process. We looked at existing charters and manifestos for pedestrian rights and drew a lot of good ideas from them. We decided that it was important that the Charter should be more than a declaration of the needs and rights of pedestrians, but should also include a series of actions. Each of the eight principles in the charter has a number of actions attached to it. Although emphatically pro-walking the Charter is not anti-car. You can download the Charter in English from here. The document is also available in other languages, please check the Walk21 website for them (Link provided below). If you are interested in the Charter in French, German, Spanish, Catalan, Danish, Portuguese or Italian, please click on the button below. 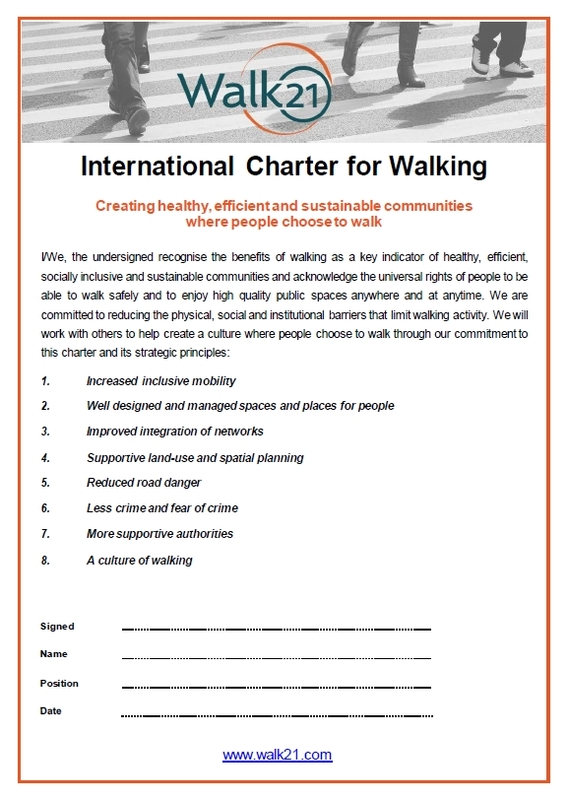 You can support the Charter by signing it and encouraging friends, colleagues, government bodies, and national and local organisations to work with you to help create healthy, efficient and sustainable walking communities throughout the world. Please sign the Charter on the Walk21 website.